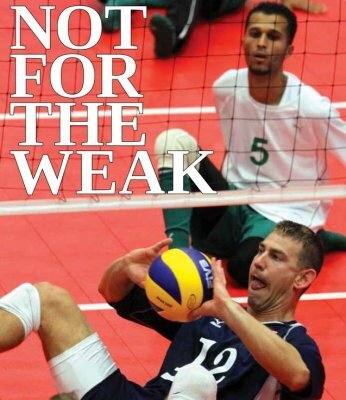 Once again Durham Attack Volleyball Club has stepped up to promote the exciting sport of Sitting Volleyball. Last month DA had two National Sitting Volleyball team members join their 13U, 14U and 15U Boys and Girls at their annual teambuilding weekend at Madawaska volleyball camp. A little bit of rain did not dampen the enthusiasm of the 140 young Attack athletes as they learned about a form of their game that was started after the Second World War as a tool to help rehabilitate injured soldiers. For most of the participants it was their first chance to meet and play with a National Team athlete while learning a whole new form of volleyball. Each team was able to get some instruction from National Team members, Jason and Jamoi, before trying to execute some passing, hitting and serving drills. Half an hour of game play followed as the club players quickly caught on to the intricacies of the sitting game and were eager to take on all comers. As a Club we are committed to providing an opportunity to all who want to play volleyball, regardless of experience and ability, via our rep, recreational house league, and sitting volleyball programs. Durham Attack will once again be hosting a Friday night Sitting Vvolleyball drop in, this year at Fairport Beach P.S. in Pickering from 6 to 8 pm starting October 12th. This is an open evening where all ages can come out to practice and play sitting volleyball with experienced coaches and you never know when one of the national team members will be on the court. The game is simple, it’s volleyball, with a few small modifications: The court is smaller, 10 m baseline to baseline and 6 m wide; net height is 1.15 m for men and 1.05 m for women; blocking the serve is allowed; servers’ legs can be in the court however their buttocks must be behind the base line; when touching the ball a portion of the player’s torso must be touching the floor – the ‘one cheek’ on the floor rule. All the other rules of the game apply to what is always a fast paced and fun form of volleyball that is spreading quickly across the Pan American zone. We have again been recognized by the Canadian Paralympic Association as a key First Contact organization and have received a second grant instalment of $5,000 for our Sitting Volleyball program. We’re proud to be a pioneer in providing this program to the volleyball community and already three of our participants have made the National Team. Durham Attack has supported me through multiple steps of my journey. The first, and maybe the most important, is the initial one. DA gave me an avenue for rehabilitation, physically and socially just after I acquired my disability. Through them I learned to play and love Sitting Volleyball. It gave me a chance to improve my skills which led me to being selected to represent Canada in international competition as a member of the National Team. Playing Sitting Volleyball has, in the past, been rated by our athletes as one of the most profound experiences of their season. Please come out and participate in our program – everyone is welcome. For a peak at Provincials check out this video. We are proud to announce that due to the success of the Sitting Volleyball program that we pioneered in the 2010-2011 season, the Canadian Paralympic Committee has awarded us with a $10,ooo First Contact Funding grant to help us take our program to the next level within Durham and the GTA. To do this we need your help. We are looking for FOUR individuals who want to develop their expertise in coaching the sport of Sitting Volleyball and work as a team that delivers an expanded program for 2011-2012, culminating with the inaugural 2012 OVA Sitting Volleyball Championship. We are looking for FOUR committed individuals (two male, two female), volleyball coaches or athletes, from within the Durham/GTA volleyball community, who want to help us take this program to the next level. Please read the attached project description, and if you are interested respond to our Sitting Volleyball Program Director, Lawrence Flynn (flynn_lawrence@hotmail.com), with an email describing why you want to be involved, and a volleyball resume. The application deadline is July 8, 2011. At our Madawaska teambuilding camps for athletes this past Fall, our athletes, girls and guys, rated playing sitting volleyball with our National Team members as one of their most profound experiences. We got our fledgling Sitting Volleyball program off the ground this season, and with support from the Canadian Paralympic Association have some lofty goals for next season. Here is a nice article out of the U.S., from VolleyballMag, who has approached us about writing a feature article about volleyball in Canada.